Online Returns: In New Poll, Shoppers Say They Hardly Ever Make Them. Um, What? Retailers say returns are costing them a fortune. But in a new NPR/Marist poll, about 90 percent of online shoppers say they rarely or ever return orders. For many, it's not worth the hassle. 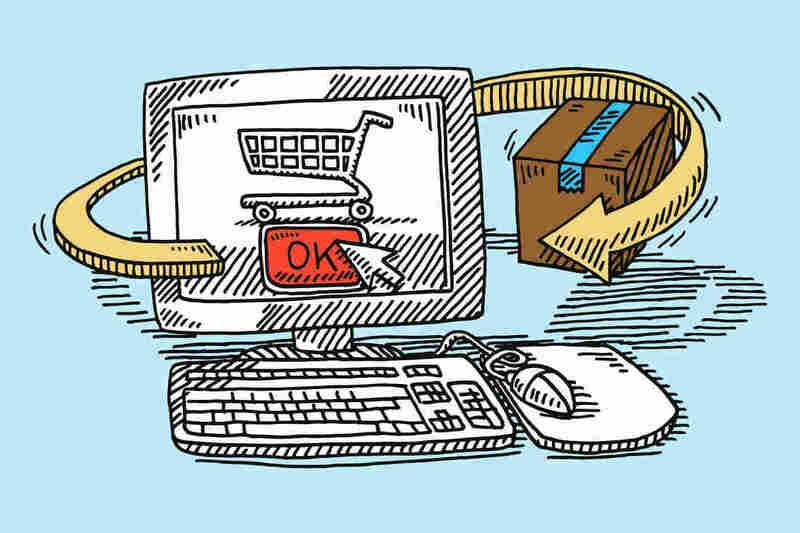 In a new NPR/Marist poll, 91 percent of American online shoppers said they "never" or "only rarely" return things they buy online. Summers knows what this looks like from the inside. She's an executive at a company called Optoro, which is built around returns: It helps retailers re-purpose or resell all kinds of things that people send back. "E-commerce has a much higher return rate than traditional brick-and-mortar stores do," Summers says. By Optoro's estimates, shoppers returned $385 billion worth of inventory last year alone. But according to a new NPR/Marist poll, 91 percent of American online shoppers said they "only rarely" or "never" return things they buy online. And even more — 94 percent — said they "only rarely" or "never" make an order expecting to return at least part of it. "That surprises me," says Stacey Steiner from Jacksonville, Fla. She says she tends to order clothes online in batches. Recently, her birthday was coming up, so she bought about 13 dresses from JCPenney, tried them at home and picked three to keep. "I could just cycle through the website and filter through — I know I want three-quarter length sleeve and this type of dress," she says. "If you go to the store, you have to wander around and go, 'Oh, is this long-sleeve?' ... and then you're looking through shirts and pants, and all these other things that aren't anything you want to do with." Steiner has an idea why people might say they don't return things: "They're just like, 'Ah, whatever, I don't want to deal with returning it.' "
And she's right. According to the NPR/Marist poll, free returns are a big factor in where people chose to shop. But a majority of online shoppers say they've kept purchases that they actually intended to return, mainly because returns are a hassle. Katie Burns is one of them. "I have a whole basket in my apartment labeled 'returns' and have had things in there for months," Burns, from San Francisco, wrote to NPR. "I cannot seem to get it together to get things back in the designated window, and then I talk myself into keeping the items even if they weren't exactly what I wanted." And then there are people who don't return items for an even more straightforward reason. "I don't enjoy shopping. It's not my favorite thing to do," says Pat Novak, who lives north of Grand Rapids, Mich. She says she only shops online when she can't find something locally — something she can examine closely. She spends time finding exactly the right thing that would last her as long as possible. In fact, Novak's current problem is wishing she didn't have to return something. Her husband had ordered a $40 fuel tank for a camp stove, but instead, the company accidentally shipped an $800 5-foot cooler. "They won't take it back!" Novak says and laughs. She says the company apparently only allows returns for defects or warranty issues, not wrong shipments. "So we have this thing sitting in our basement that we can't get rid of," she says. "We don't want it." This is certainly a unique reason for not returning an item — but that still didn't seem to fully explain why most online shoppers claim to barely ever return things. Could it be that polling people about the frequency of returns was just prompting them to put the best foot forward? Like asking them whether they floss every day? "I understand the skepticism, but I've done surveys for a very long time," says Barbara Carvalho, director of The Marist Poll. She says polling accounts for this kind of calculation, giving people a range of answers instead of a "yes" or "no." And more importantly, Carvalho points out the other side of the findings: the 9 percent of online shoppers who admit to making returns "often" or even "very often." "That 9 percent doesn't sound like a lot," she says, "but it actually translates into almost 16 million adults in the U.S."
In other words, a small portion of shoppers creates big headaches for stores with costly returns. And the retailers' biggest concern is fraud: people who return items that are, for example, stolen, worn or used. Most major companies work with a designated firm that tracks the frequency and value of individual shoppers' returns to spot fraudsters. But some shoppers say they get caught in the middle. The Wall Street Journal has recently reported on consumers who argue Best Buy and Amazon had unfairly blocked them from making purchases by interpreting their return behavior as suspicious. "Amazon doesn't tell customers in its return policy that their return behavior can get them banned," the Journal reported. "but the company says in its conditions of use that it reserves the right to terminate accounts in its sole discretion." In the NPR/Marist poll, a quarter of online shoppers said they "only rarely" return worn or used items; 74 percent said they "never" do so. Only 2 percent said they make such returns "often" or "very often." One thing that this reporter would still like to know is: Who are the other roughly 90 percent of online shoppers who, according to the poll, also pretty much never regret their online purchases?